Damon Roundtree, 18, carefully removed charred skin from a roasted red pepper, slicing it into narrow strips. That one simple act had ramifications well beyond embellishing a sandwich, which looked delicious: job readiness; opportunities for underemployed city minorities; union growth; union relevance; schools serving communities; employer savings on training; plus a crew of cooks, servers, bartenders, and dishwashers ready to work at a new Philadelphia International Airport restaurant. Lots loaded onto that sandwich. 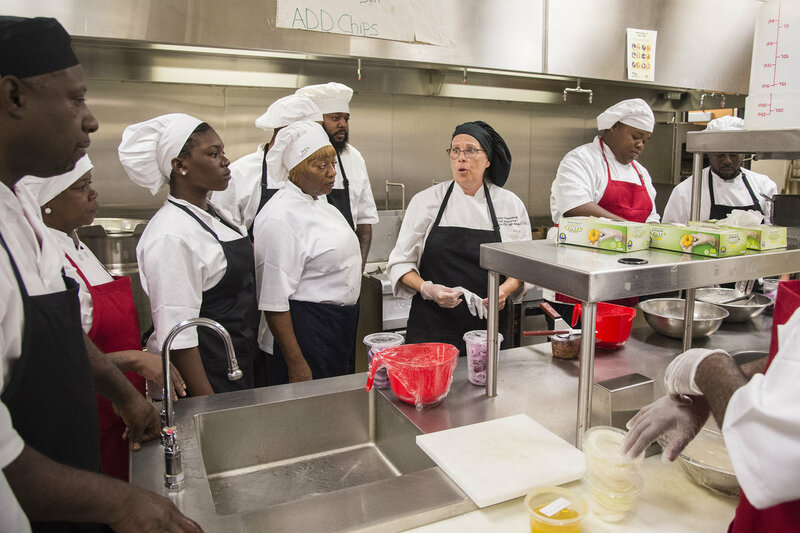 Wearing a black cap, Penny Greenberg, 62, the head of the culinary program at Dobbins Career and Technical Education High School, conducts a training program sponsored by hospitality union Unite Here as students gather around the stove. On Tuesday, 75 graduates of the first class of the Unite Here Philadelphia Hospitality Academy will be honored at City Hall. 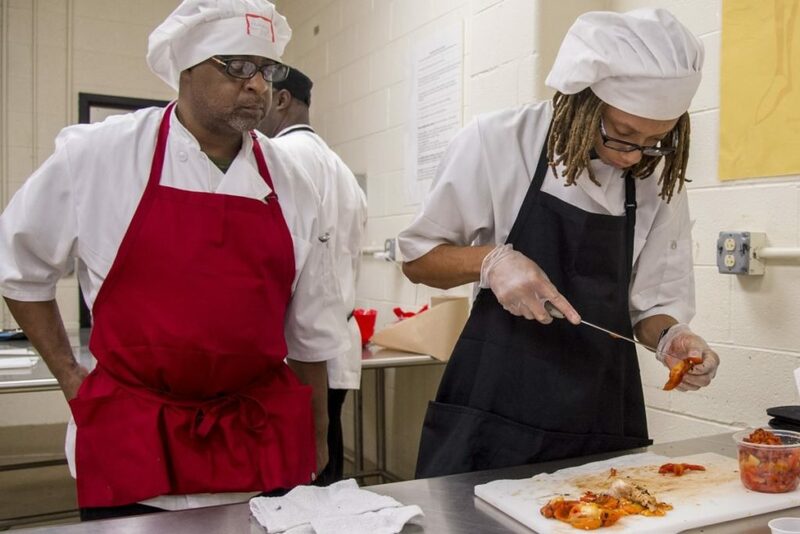 Students range in age and capability from recent high school graduates such as Roundtree, a novice, to longtime chef and manager Anthony Cunningham, 53, who was laid off from his job at a Japanese restaurant in June. “I’ve put in resumes, but I can’t afford to wait for a vacancy,” Cunningham said. Unite Here Local 274, which represents hotel and food service workers, partnered with Philadelphia’s community-schools program and the city’s workforce-development program to deliver food service workers armed with industry certificates and training in customer service and skills to Philly Concession Enterprises (PCE), a unionized company that operates airport restaurants. “The nice thing about this project is that it’s really employer-demand driven,” said Patrick Clancy, chief executive of Philadelphia Works, the quasi-government organization that distributes government and private workforce-development dollars. Philadelphia Works provided $48,000 from a Walmart Foundation grant to underwrite the $65,000 program, with $5,000 from from the union’s newly organized employer/worker joint training fund. The $65,000 covered instructors, professional knives for the chefs-in-training, textbooks, even the beer needed for the beer-battered fried onion rings that Roundtree and his classmates cooked Tuesday. It also covered fees for three industry certifications: ServSafe for hygienic food handling and two others for alcohol. The students were not paid, but they will have the certificates, which could easily cost $150 or more to obtain on their own. The cooks start at $12.25 an hour, up to $13.35 in April, and dishwashers, cashiers, and other hourly employees will earn $11.25, then $12.25, with vacations, health insurance, and schedules set by seniority. Shannon Turner, 27, a former dietary aide in a nursing home, works on making onion rings. Courses for servers, cashiers, hosts, and dishwashers lasted for two to three days. The cooks had two weeks’ training. It’s not inevitable that hotels become unionized, but it’s typical, with employer neutrality for elections, she said. Khalil Yaacoub, operations manager for PCE’s restaurants at Philadelphia International Airport, said the partnership saved the company more than $100 per new employee. For example, PCE could spend $135 per employee for the ServSafe certificate, but Tuesday’s graduates will already be certified. Yaacoub said 450 candidates applied for 90 jobs at Bar Symon, coming through CareerLink, the union, and Murrell Dobbins Career and Technical Education High School. Yaacoub chose the most qualified, and the union prescreened them for airport background checks. “Usually, it would have taken a few people to do this job — screening, interviewing, and filling out paperwork,” he said. 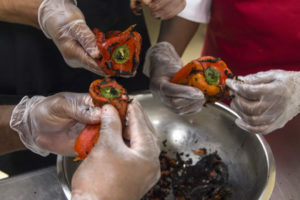 Students participating in a training program to learn restaurant skills, conducted by hospitality union Unite Here, prepare roasted peppers for a dish. As cooks roasted peppers Tuesday, Toni Damon, Dobbins’ principal, sat on a kitchen chair watching. Home school for the project, Dobbins, in North Philadelphia, is part of Mayor Kenney’s community-schools initiative, designed to turn schools into resource hubs for their neighborhoods. In North Philadelphia, jobs are the missing resource. “The union has been great,” Damon said. 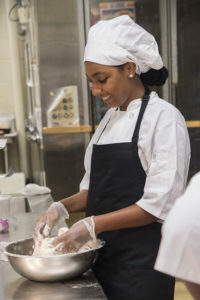 “They know what’s current in the industry.” Her school, which offers culinary arts, is undergoing a $37 million renovation, so the program borrowed Strawberry Mansion High School’s kitchen. Unite Here Local 274, Philadelphia. 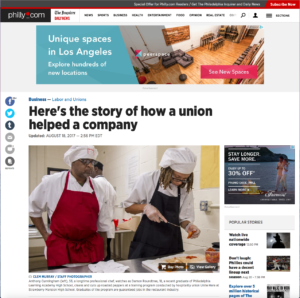 Represents: 2,500 hotel and restaurant workers, Philadelphia school-cafeteria employees, Aramark employees at area stadiums, workers at some airport eateries. Revenues: $1.3 million, mostly from dues. Murrell Dobbins Career and Technical Education High School. Where: 2150 W. Lehigh Ave., North Philadelphia. Enrollment: Citywide admissions. 600 enrolled, still vacancies in programs. Can accept 700. Name: Philly Concession Enterprises, a branch of Midfield Concessions Enterprise Inc.
What: Operates restaurants in 10 major airports, including Philadelphia. At PHL: Will employ 180 at Villa pizza, Cantina Laredo, Wendy’s, Earl of Sandwich, Far East, Red Mango. Coming soon: Mo’ Burger, Bar Symon.